Non-iron, easy iron, easy care and wrinkle free shirts are easier to iron than ‘regular’ shirts. However, it doesn’t mean that you don’t need to iron them at all – in most cases they need to be ironed, but you can iron them quickly and easily, and they don’t tend to wrinkle much. Shirts made of non-iron fabrics can cost cheap, but they’re not a bargain, because they often look cheap and feel cheap; moreover, non-iron shirting doesn’t absorb as much water as ‘regular’ shirtings. However, more expensive easy care shirts can feel and look better than cheap ones. Marks & Spencer non-iron shirt. Most non-iron fabrics are treated with chemicals like formaldehyde, so they’re not good for your health and can cause an allergy. 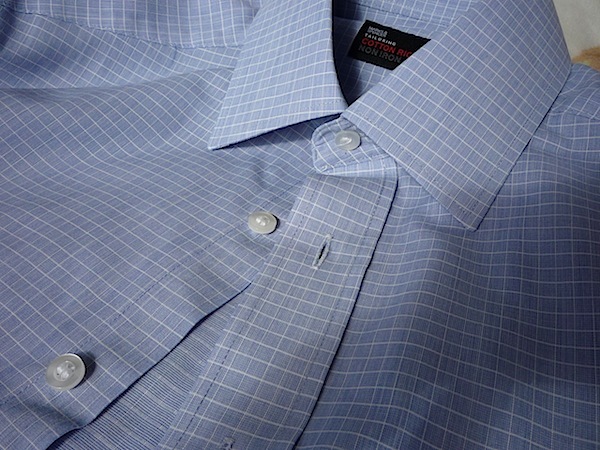 However, you may find good easy care shirtings – for example, Swedish shirtmaker Eton uses them (though Eton shirts are quite expensive, of course). If a shirting has Oeko-Tex Standard 100 certificate, it wasn’t treated with formaldehyde, so it’s safe for your health. Sometimes non-iron fabrics wear out quickly, but not always. For example, you may find a non-iron shirt which will last for three or four years, and the best easy care shirts can serve even longer (especially if we’re talking about high quality easy care shirtings which were made without the use of formaldehyde). However, I know only two brands that offer shirts made of high quality easy care fabrics: Bagutta (Perfect Line) and Eton. This entry was posted in Shirts by Dmitry_Vasfilov. Bookmark the permalink.